I love to travel. I love getting away from my everyday boring routines, so I was so excited to drop Lady H. off at my Mom's, grab my BFF, and drive to Atlanta. We had scheduled a girl's spa weekend and we had lots of fun, as we always do where ever we go. Even though our spa experience was slightly less than stellar, we still got a good laugh and enjoyed our time. Next door to the spa was a specialty chocolate shop, LW Chocolatier, so of course we went inside. It was just a cute little boutique, very neat and very chic. We ended up just getting a couple of pieces to share. Let me tell you, those chocolates were outstanding! I definitely recommend the sweet raspberry truffle, raspberry marmalade filling inside a milk chocolate or bittersweet chocolate molded shell. Wonderful!! 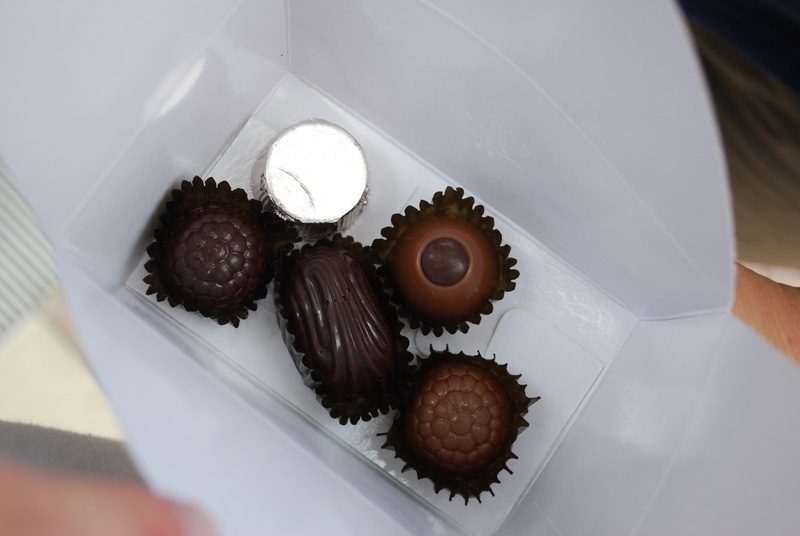 The rectangular chocolate is a chocolate mousse truffle, dulce de leche truffle is wrapped in silver foil, and the milk chocolate truffle with the dark chocolate dot is a mocha filled truffle!! All were just magnificent and such a great treat right after a 60 minute Swedish massage and traumatizing reflexology! Yum. 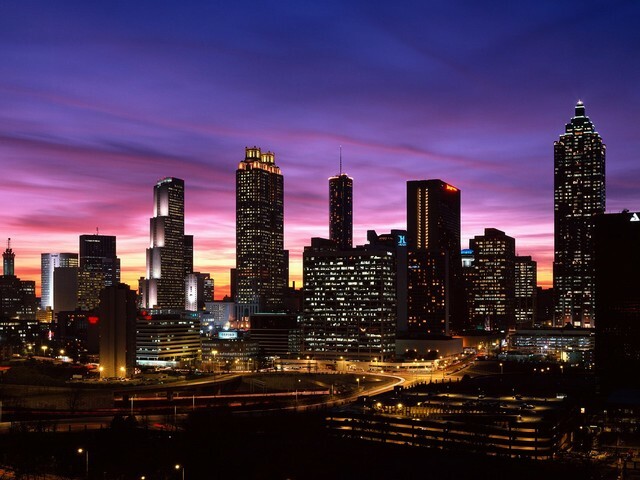 LW Chocolatier is located at One Buckhead Plaza, 3060 Peachtree Rd. 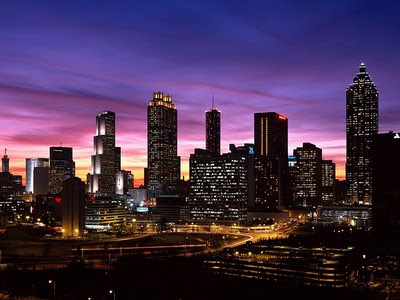 NW Suite 40, Atlanta, GA 30305. After several hours of shopping, we ate dinner (forgot to take camera, but we gabbed the whole time anyway) and shopped some more and then crashed at the hotel. The next morning I told the BFF that we simply must go find Sublime Doughnuts. I had seen Sublime in Southern Living Magazine and also on Bakerella's Website. They just looked way too good to pass up. 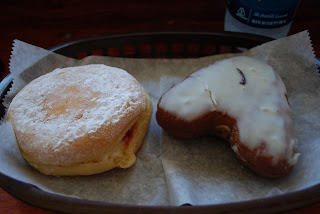 The BFF got the dulce de leche and the raspberry filled dark chocolate iced heart. (Can you see a trend? The BFF loves the raspberry/chocolate combo). She graciously let me try both and they were wonderful. I got the fresh strawberries n cream and the A-town Mocha. The fresh strawberries n cream was aaaa-mazing! 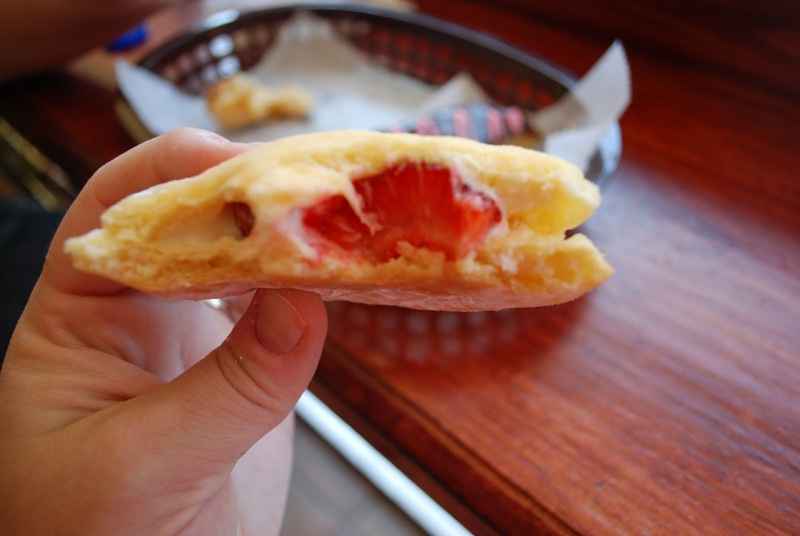 It's a regular doughnut dusted with powdered sugar and filled with fresh strawberry slices and vanilla cream cheese. I seriously think I blacked out for a second because of the overload of sheer deliciousness from this doughnut. 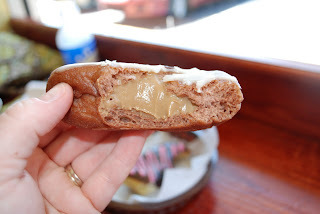 My second treat was the A-Town Mocha, which was "A" shaped and filled with a mocha cream filling and iced with a vanilla glaze. Yikes!! This was incredible as well, and I'm not even that crazy about mocha flavored stuff!! We walked out of Sublime happy, satisfied, and ready to hit the shops. If you are in the Atlanta area, or even just passing through on I-75, you have to stop and get some of these insanely delicious treats. 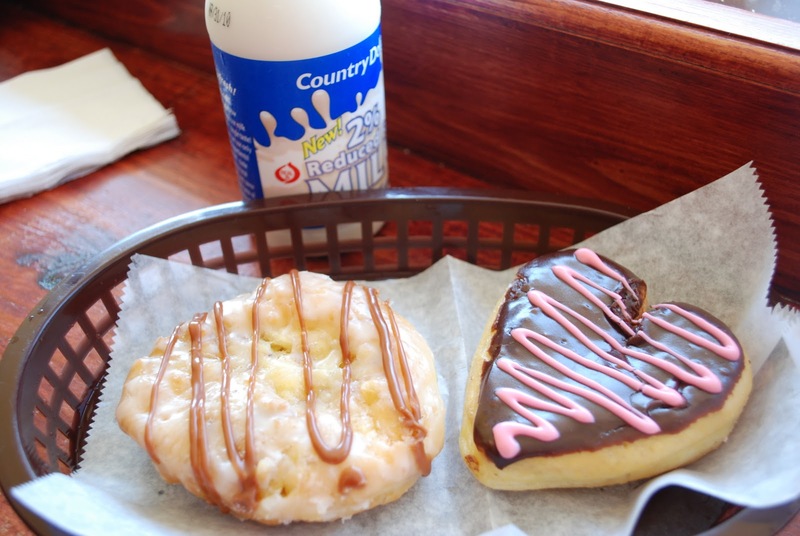 Sublime Doughnuts is located at 535 10th St., NW, Atlanta, GA 30318.